Google Places has been gone for 6 months now, and “Google+Local” has been its replacement ever since. This has been the first phase – and probably the longest phase – in Google’s effort to move everyone’s business onto Google Plus. The transition to Plus isn’t complete, as you may know. Many businesses have access to the newer, “fancier” type of Google listing (more on this in a second), while others aren’t eligible to use it just yet. Some business owners have decided not to bother “upgrading” manually and choose instead to wait until Google finally rolls out the upgraded version for everyone automatically. But here’s why I’m writing: extremely few business that have access to the (relatively) new bells and whistles have actually been using them. Your Google+Local listing is one of the “fancier” ones if it has four tabs AND a blue “Write a Review” button (among other indicators). If your Google page looks like the above, this article is aimed right at you. Even if your business is service-based (where you travel to your customers rather than the other way around) and therefore isn’t eligible for the above type of listing, you should still give this a quick read. Why? Because sooner or later your Google page will have the new bells and whistles, too – at which time you’ll want to use them to the fullest. There are 3 Google+Local features I’ve seen few to no businesses use. I consider them low-hanging fruit because they’re easy to put into action and benefit from. Do I consider these suggestions revolutionary? Of course not. None of these things is likely to get your rankings up if they’re down in the dumps. But are they slight edges that may make you a little more visible to local customers? Damn straight. Low-Hanging Fruit #2: Reviewing other businesses – and seeing whether they’ll do the same for you. Yes, you can do this. 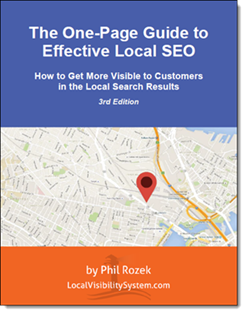 David Mihm wrote about this immediately after Google Places became Google+Local. ‘Fraid I don’t have a real-life example to show ya, though: I’ve yet to find a business that uses this smart approach to getting reviews. Low-Hanging Fruit #3: Asking customers to add you to their “Circles.” This doesn’t seem to affect local rankings, at least at the moment. Probably will in the future, but not now. 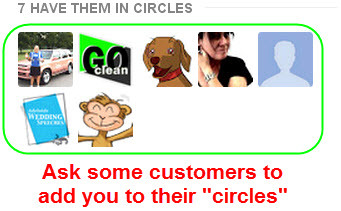 So why bother asking customers to add you to their circles? Well, because you’ll be a little more visible in Google’s “personalized” search results to the people in your customers’ circles. Because birds of a feather flock together, and because friends talk with each other, some of those people actually may be potential customers. As hard as it can be sometimes to ask (or remind) customers to review you, once they’ve gotten around to doing it, they do NOT like going to that effort only to have the review get filtered. I think there are several reasons for this, but just to speak for myself, I know that when that sort of thing happens to me, I feel like I didn’t make good on my “word” to leave some helpful feedback.Even a customer who’s frustrated by Google’s filter will probably still be glad help you, the business owner, in some way – if he/she knows what to do. Adding you to circles obviously isn’t as good as getting a review, but it helps in the ways I already described, and it helps maintain the feeling of a good quid pro quo. Can you think of any other Google+Local features that more business owners should be using? Leave a comment! The ability to add rich text, and lots of it, to your description is very alluring feature. Be cautious however that you keep the description short and punchy. If you go on too long critical information like location and reviews are pushed well below the fold and might never be seen. Another “feature” of the merged result is one that has bit the dust in the dashboard is the ability to add videos. Thanks for weighing in, Mike. I hadn’t considered the point about how a description that’s too long will push down the reviews. I do like the new type of description insofar as there are fewer cases of “Ah $#*!, I’m at 201 characters! Back to the drawing board.” But restraint still should be the order of the day, as you suggest. Good call regarding the videos. Maybe half the “merged” (upgraded) listings I’ve seen have videos on them. Speaking of which, a side-note: I actually noticed something really weird the other day, which was a “merged” listing that had the “Videos” tab missing. I’ve never seen a listing with just 3 types. (I’m sure it’ll eventually go back to normal later, but here’s the link: https://plus.google.com/114395367654246211516/about) Seems like a bug. PS that all being said, I am still recommending that most folks wait until Google shows their cards as to what the final products and features sets will be before making a decision to move to the merged social local page. Definitely…that’s what I tell most of my clients (of the ones who are eligible). This low-hanging fruit of course mostly applies to the business owners who, wisely or unwisely, have an upgraded Google+Local page already. They haven’t reviewed us yet, but at least we know how it all works. Thanks a bunch for the in-the-wild example, Eric. You guys are smart! Good points to bring up Phil! I was thinking ability to add videos was a bonus that should be listed on top too. But agree with waiting in most cases due to bugs and lack of clear insight as far as where this is ultimately heading. Oh and the other major low hanging fruit benefit to merging that should be mentioned, is the ability to POST updates. We lost that feature on the old G+L pages plus it was limited to 160 characters. Now with the fully merged and upgraded pages businesses can essentially do full blog posts right on their page, complete with links and product images. I think this is a BIGGIE! Good call on both points. What I’ve found, though, is that at a good half of businesses with upgraded Google+Local pages are pretty good about posting. Maybe I’m just looking at an unrepresentative “core sample” – always a possibility. I actually had a paragraph I was thinking hard about including, to that effect. To me, it just didn’t seem to be one of the features that business owners almost always overlook – although surely a ton of people do, as you suggest. For those who are going to set up a Google Page for their business, I suggest you get through the verification before you format the page. When I did my Google Page, I first wrote a good introduction, added links and formatted it; but when I went to verify it all the formatting disappeared. I wasn’t sure what was going on. A week or so after entering the verification PIN I noticed my original formatting reappeared…fortunately. Save yourself the stress! Thanks for the great advice, Janet! I also suggest that one saves in a (Word doc or whatever) any description(s) he/she writes, exactly for reasons like the one you mention. I do this for my clients, and it’s been a life-saver on a couple occasions – and a source of regret when I haven’t bothered. Great post, Phil. There is such a wealth of actionable information on Local right now. Low-hanging fruit for restaurants and venues: Seamless integration with Google Events and OpenTable’s “Find a Table” online reservation feature for restaurants. Both buttons are located directly below the driving directions and map. Take that Facebook Pages for Business! On a side note: I wonder if Barbara Oliver has any idea how much link love her online properties get as a result of being Mike B’s “flagship client”. Good call, Jason. I guess one upside to Google’s long-standing bias in favor of restaurants and the like is…well, what you just said. It does seem like there’s a lot of low-hanging fruit for that type of business in particular. Great post Phil. I think we are all guilty of forgetting to think outside of the box, and use some of these, often obvious techniques. Hey Adam, thanks for weighing in! Some of this low-hanging fruit really is hidden under a leaf: Google doesn’t seem to talk about the functionality of Google+Local pages beyond “circles” and “posts,” and obviously a great many businesses don’t have “upgraded” pages yet. I look forward to hearing how it goes with low-handing fruit #2, BTW. Great points to keep in mind when creating your Google+ Business page. One thing that definitely helps as you mentioned is using images on your page. Anything that makes your listing stand out more and gets more eyes to look at it helps, and it only takes but a few more minutes. Great email. Is there any way for customers (patients in my case) to write reviews from their android/apple hand-held devices? We used to have happy customers write reviews from one of our office computers, but those reviews haven’t shown up, so mobile reviews would be the easiest way. On the iPhone/iPad there is no way currently to write reviews other than downloading and using the Google Local app. It is obviously a lot to ask someone to download it although I suppose you could give them a QR code to the web page for it. On the Android, on the other hand, mobile reviews are a piece of cake and seem to be much more likely to “stick”. PS The web based pages for Google+Local have recently be updated and it is possible that a web based review might soon be available but it isn’t as of today. Obviously, you just got a reply from “da man” – to which I don’t have anything to add. The people who are toting iPhones you may want to ask for reviews on the spot (as you’re doing). And not just Google+Local reviews: you’ll want to ask some people to go to different sites, possibly Yelp, CitySearch, InsiderPages, etc. But the people who don’t have smartphones you’ll want to get in contact with later. Google has flip-flopped on the issue of whether on-site “review stations” are OK, but at the moment it seems to be a no-no. If you can email your non-mobile patients later or print out a reminder / some instructions for them, I’m sure Google’s filters will still nab some of the reviews but probably far fewer than they’re nabbing now. i just downloaded the google + app again for my android device. After I click on the “Post” button for a particular business, a box pops up that says “Set appearance” and asks me to submit a “Name or nickname”. I typed in my name and hit on “Get started” button, but get an error message “Update failed, please try again later”. Any advice? I actually don’t have an Android phone, so I must say I’m stumped. Maybe someone else here has a troubleshooting tip (?). Phil–do you have any evidence that reviews by companies are taking? I’ve tried several, but none have yet displayed. Not sure if this means a higher standard for company to company review content, or if it’s just another element of the train wreck. Thanks. No, aside from others’ experience – like in Eric’s comment, above – I don’t have any evidence that company-to-company reviews are any more or less likely to “stick” than customer-to-company reviews are. I would think that Google’s filters behave the same way. At least to me, the potential benefit of these B2B reviews is simply that they’re another option – that they represent another group of people who might be able to review you. Obviously, there are still some hurdles to clear, but my overarching point is that most business owners don’t even know they can review another business.